What if you had the chance to buy Pick Up Sticks charms that were a completely new concept, but vintage in the truest sense of the word? One of a kind? So gorgeous they make your eyes water? And still as affordable as all our other charms? We heard you when you said you wanted cooler than cool sustainable jewelry. Except that, just as you might expect from Pick Up Sticks, we used something old and intriguing to create it. 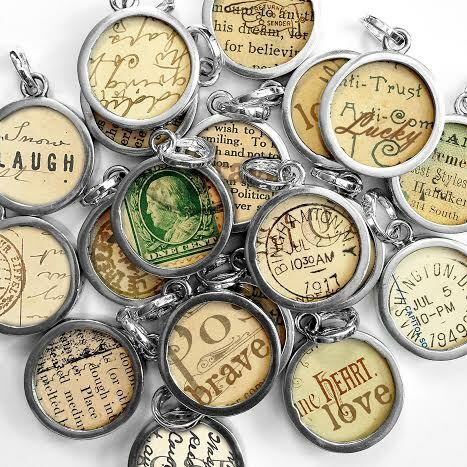 Recycled paper photo charms. Created from actual antique and vintage paper, embellished by the Pick Up Sticks crew, these charms are green works of original art unlike anything we’ve ever created before. “I’ve always loved the fingerprints, the delicate penmanship, the funk and smears and water stains and the crazy way old paper looks and feels.” Sabrina says. The Pick Up Sticks logo, a collage of an old envelope, postmark and antique type, is a reflection of that. 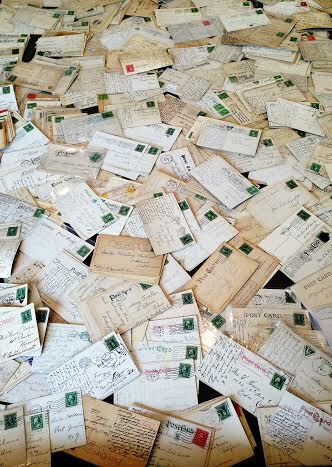 She’d take her treasures home with her, going through piles of postcards, and sometimes she’d find one with a wine stain, perhaps carelessly spilled by a tipsy ex-lover who was trying to bolster her courage before she wrote a “Dear John” letter in 1929. She’d find notes that were obviously written with quill pens and notes mailed across town with invitations to Easter Sunday dinner. She was holding personal histories in her hands. And she loved it. Now, years later, Sabrina and Glena and the Pick Up Sticks crew have decided that we all deserve a chance to hold history in our hands. And to wear it as a charm on a necklace or a bracelet. The charms in these images are just a sample of the recycled paper photo charms that are brand new to Pick Up Sticks this season. Each one is created from an actual piece of antique paper often with our own Pick Up Sticks hand-embellishment added. Imagine the excitement of finding a postmark over a hundred years old from the early 1900’s encased in glass ready for you to wear! You might have questions, so we created our own little FAQ section below to better introduce this new line we know you’re going to love. Q: Yes, in fact, we’re cutting up actual antique and vintage paper. Is this art of crime? A: Of course it’s art! If it were a crime, you’d first have to imprison Pablo Picasso and Georges Braque and dozens of other artists who used pieces of old paper in their works of art. Q: I can’t imagine any reason to destroy a perfectly good vintage postcard. Why is this good idea? A: We’ve all heard about desirable postcards that fetch big money because of their historical or artistic significance. But that’s not the kind of postcards we use, so don’t panic. We would never cut on collectible paper. We look for paper and cards that are so damaged even a fanatical collector would refuse to buy them. Dealers who sell paper will freely admit that common postcards are dumped into the trash daily. Why not repurpose them into something beautiful? Think of it as saving them from the landfill. Q: Why don’t you just scan them and print them out? Why are you cutting them up? Because you would be able to tell the difference! A common desk printer just can’t capture the beautiful printing processes that were used, much less the beauty of age. Postcards get outrageous handling, bumps, bruises, discoloration, creases, writing, postmarks, stains and smudges. And we love that! We are saving resources by not using ink or new paper. The process of manufacturing both ink and paper is detrimental to the environment and results in tossed away cartridges. We’re working on reducing our carbon footprint here. In this digital age, handwriting is rapidly becoming scarce and people are throwing out documents by the truckload. Let’s save these beauties! Now you get to wear a piece of history. Imagine where this lovely piece of paper has been and the stories it has to tell. Q: When will they be available and can I buy a truckload? A: Date of availability RIGHT NOW, but quantities may be a tad scarce. We hope to have a lot available soon, but maybe not a truckload. These are labor intensive and very unique, requiring hands-on time in the studio.. Despite that, the cost to you will be the same as our other Pick Up Sticks charms. 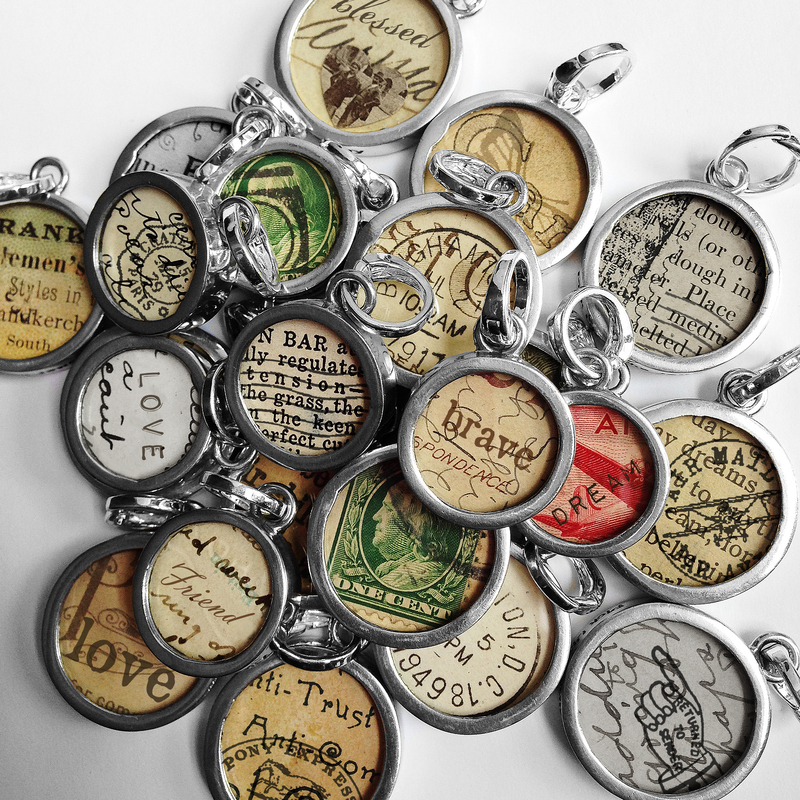 Find Recycled Charms on our Website!